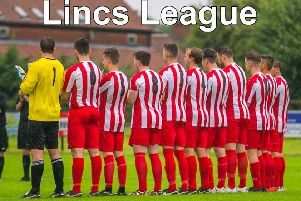 Skegness United earned a penalty shoot-out victory to progress in the Lincolnshire League’s Challenge Cup. After a 3-3 draw, it was the away side who won through from 12 yards at the expense of Ruston Sports on their 3G pitch. United made a couple of changes to the team with Chase Maddison coming in for Travis Portas, on duty with the county squad, in goal while Kyle McGuigan also returned to the team. The game began at a fast pace, Louis Saebe teeing up Dom Goddard, only for his effort to be blocked. As United pushed on, Harry Ginniff saw an effort saved by Warren McCreeth, Archie Paul headed wide and Goddard was denied by the keeper. Ruston’s took the lead on 25 minutes with their first effort on goal, Will Fry firing past Maddison. McCreeth denied Goddard again before the away side levelled just before the interval, the stopper dropping a free kick and Saebe knocking home the loose ball. Saebe found time to strike the Sports woodwork before the break. Two minutes after the re-start Goddard put United in front, finishing a move including Corey Cunliffe and Saebe. McCreeth continued to make saves to deny Saebe, Ginniff, George Hobbins and Cunliffe twice, vital saves as Chad Taylor pulled the hosts late on. The first period of extra time began with United claiming to no avail that an effort from a corner had crossed the line. The final 15 minutes saw Goddard strike straight at the keeper and Fry do likewise for Rustons. Danny Reid put Skegnes in front for a third time after McCreeth had dropped the ball following another corner, only for Jaime Pearson to level things up again. From the penalty spot Reid, Maddison, Jake Portas and Ginniff kept their cool to earn a 4-3 victory. Manager Gary Edgley said: “I still can’t believe the game went to extra time, let alone penalties. “We deservedly went through to the next round, but we need to learn to put teams to bed. United will now play Hykeham Town in the semi-finals. UNITED: Maddison, Gray, Paul, J. Portas, Muirhead, McGuigan, Hobbins (Reid), Cunliffe, Goddard, Saebe, Ginniff. Man of Match: Corey Cunliffe. On Saturday, United host Cleethorpes Town DS in the Supplementary Cup (KO 2pm).